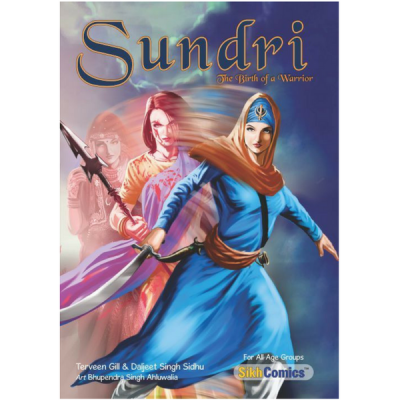 This is the third volume of the five book series. It covers a part of Guru Nanak’s first udasi, or extended travel, and the complete second udasi. – On the way back to Talwandi, Guru Nanak and Mardana stop by at several villages. – At Talwandi Guru Nanak blesses Rai Bullar with a child. – On the way to Sultanpur, Guru Nanak visits Pakpattan, the town famous for Sheikh Farid. – After spending a few months at Sultanpur with his family, and his sister Bibi Nanaki, Guru Nanak leaves for Dipalpur. Here he emancipates a leper and cures him of his disease. – In Lahore, Guru Nanak advises Duni Chand against holding a feast in honour of his dead ancestors. Duni Chand also learns about the transient nature of wealth and how it can never go along with us in death. – At Sialkot, Guru Nanak urges Pir Shah Hamza not to destroy the town just because there is one person in the town that did not honour his word given to the Pir. The Pir also learns that Death is the truth and Life is false. – At Ujjain, Guru Nanak Dev ji advised against lighting lamps to light up the path for the dead. He said that only God’s True Name can end the suffering and guide us while we are alive and after our death. – At Khandwa, Guru Sahib composed the baani called Dakhni Oankar. Here he told the pilgrims to pray only to One God because all deities including Brahma, Vishnu and Shiva are the creation of Almighty Waheguru and that all deities too serve the Almighty. – At Bidar, Guru Nanak pushed a rock with his foot to create a fresh water stream. This place is now called Nanak Jheera. – At Palam-Kottayam, Guru Nanak Dev ji taught the importance of sharing no matter how little we have for ourselves. – Shivnabh, the Raja in Sri Lanka, had long desired to meet with Guru Nanak. Guru Nanak is the searcher of hearts and divined Raja’s desire. He spent about a year with the Raja. Before leaving, Guru Sahib blessed the Raja with a child. – On his way back to Punjab, Guru Nanak ji visited Multan. The pirs and fakirs of Multan were worried that Guru Nanak may diminish their importance. However, by the time Guru Sahib left, he had gained everyone’s respect and admiration for his gentleness, humility, and deep understanding of Islam. – The people of Talwandi rejoiced when Guru Nanak and Bhai Mardana returned. Rai Bullar was old and breathed his last with his head in Guru Sahib’s lap. – Before leaving on another Udaasi, Guru Nanak established the town of Kartarpur on the banks of River Ravi. 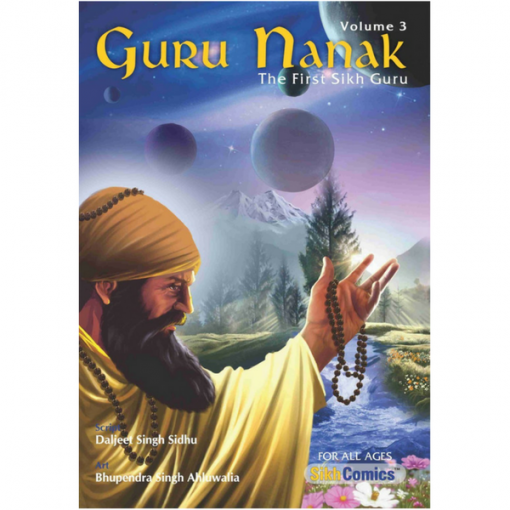 – Almost every page reveals some facet of Guru Nanak’s teachings and philosophy.